Three images are album art of our April 1st guests, Ballister. Three images are album art of icon 80’s/90’s indie rock. 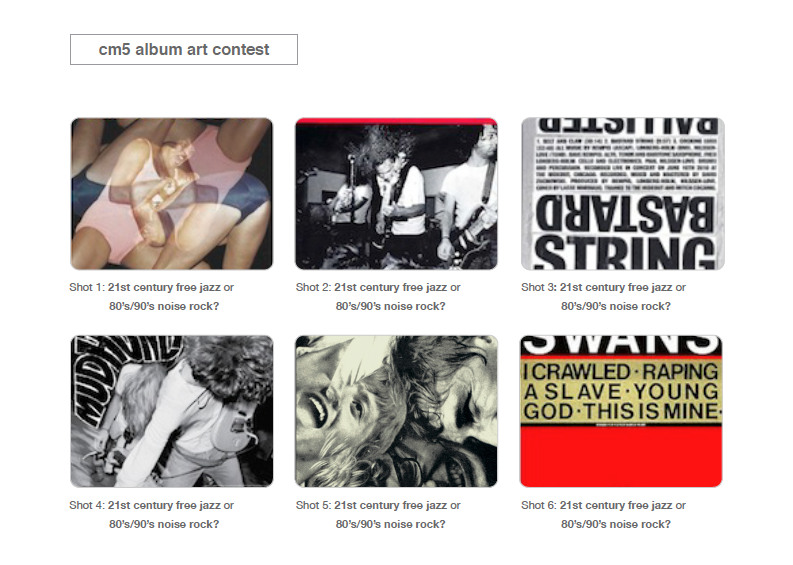 Three pieces of album art in our Web 1.0 contest are quintessential low art/dirtbag aesthetic that actively (and arguably accurately) portray the sonics contained within. Three pieces of album art here represent the sonic profile of daring, temporal modern improvisers- bravely redefining their median expression each time they perform. Right? Regardless of your predisposition on what styles of music are by nature creative or operating within known idioms, these pieces of cover art do a fine job of representing the music contained within. Additionally, the more recent cover art from our guests Ballister seems to wink knowingly at the zeitgeist of American independent rock noise. KEY: Ballister art is the odd numbers- Shots 1, 3 and 5. These records will vibrate your ossicles similarly, too. The preternaturally hyphenated trio of Dave Rempis, Fred Lonberg-Holm and Paal Nilssen-Love make loud improvised music. You can relate it to the wooly timbres and high decibel of American noise rock or to the now fifty year-old tradition of energy/free jazz as templates. Or both. Arts organizations and funding institutions have aided the union of Chicago’s improvised music scene with influential Europeans for more than fifteen years. Look over Peter Brötzmann’s broad discography to find evidence of Chicagoans in the midst. You’ll find the same if you look for Oslo’s Paal Nilssen-Love there. The Norwegian drummer has been a prolific jazz-based improviser by his late teen years of the early 1990’s, becoming the first call player when open-minded playing intersects with the loud. Count Ken Vandermark, John Butcher, Mats Gustafsson and the fore mentioned Brötzmann as key Nilssen-Love collaborations. Reed player Dave Rempis took a circuitous route to his education by starting his higher education studying music at Northwestern University, then switching to anthropology and ethnomusicology, leading him to the International Centre for African Music and Dance at the University of Ghana. His active immersion in a range of music styles in his one-year Ghana residency was quickly followed up by his joining the prolific and hard-working The Vandermark 5 in 1998 as alto saxophonist, then Ken Vandermark’s larger outfits Territory Band and Resonance Ensemble. Fred Lonberg-Holm is a fellow Chicagoan, also joining The Vandermark 5 as a replacement member in 2006 as a self-described “anti-cellist”, far more influenced by the broad-ranged underground cellists such as Ernst Reijseger, Tristan Honsinger, Abdul Wadud and Tom Cora than classically-trained string players, seemingly obscuring his Julliard School experience. The cellist actively works with ensembles including Joe McPhee’s Survival Unit III and the Peter Brötzmann 10tet. Ballister has been a working concern since 2009. There are certainly loud, trance induction moments that relate back to the golden days of FMP and ESP-Disk recordings. There are also open moments. The cello might navigate through an electronic envelope with pizzicato playing sounding like a piano. You can infer influence on Nilssen-Love’s time, accents and dynamics on the drum kit to The Who’s Keith Moon as much as free jazz legend Sunny Murray. Tags: Ballister, Civic Minded 5, cm5, Dave Rempis, Fred Lonberg-Holm, Joe McPhee, Paal Nilssen-Love, Peter Brötzmann, The Vandermark 5, Timucua Arts Foundation, Timucua white house. Bookmark the permalink.